It may be that the best way for us to break the decades-long grid in which we’re locked is to try new strategies to address the idea gap between the parties and the childish behavior reflective in both. Children in kindergarten learn and practice basic elements of fairness and sharing. Andre and Rebecca each get an opportunity to get their water color supplies first. George and Serena each have days when they are responsible for sponging down the lunch table. Small children learn that fairness means the same rules apply to everyone, and anyone who misbehaves can expect some sort of a consequence. 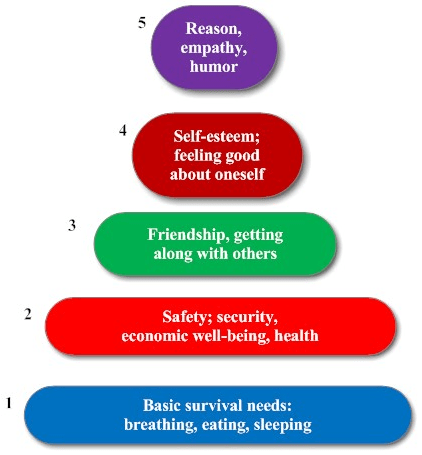 The American psychologist Abraham Maslow is noted for presenting his theory on the “hierarchy of human needs.” He studied what he called exemplary people such as Albert Einstein, Jane Addams, Eleanor Roosevelt, and Frederick Douglass. Why is this important to the ways in which Democrats and Republicans act? Let’s start with something that Eleanor Roosevelt authored: Article 1 of the Universal Declaration of Human Rights. She wrote, “All humans are born free and equal in dignity and rights. They are endowed with reason and conscience and should act towards one another in a spirit of brotherhood.” I have discussed this article dozens of times with students, and the two key words are “reason” and “conscience” because the degree to which humans possess them is what separates us from other forms of life. Bi-partisanship survives the first four stages of Maslow’s hierarchy. The disconnect occurs trying to integrate stage five into the behavior of most political persona. They often reach Stage 4 and feel good about themselves, but when it comes to exercising the reason about which Eleanor Roosevelt wrote, they fall apart. The logical and unfortunate conclusion is that most politicians feel better about themselves when they do not exercise reason, empathy, and conscience. Much more appealing than seeking solutions is playing the “blame game,” engaging in name-calling, acting with bravado, and turning a blind eye to the problems that face constituents. The one exception to this pattern is when they can agree on ways to distribute pork among themselves to ingratiate themselves with voters and to deepen their campaign coffers. Can this dysfunctional behavior stop? Yes, but it requires an understanding of a basic concept: what goes around comes around. While ideological gaps will (and perhaps should) be difficult to bridge, here are some procedural changes that are fundamental to breaking gridlock. Each party has an equal interest in supporting these changes because the reforms loosen the grip that the ruling majority has over the minority, and each party spends about half its time in the minority. Bag the filibuster. It is a tool that blatantly suppresses the will of the majority. The idea of an “up or down” vote on an issue does not favor one party over the other; it gives each group an opportunity to exercise the mandate that voters presumably gave to them. Remove all special powers of committee chairpersons. Currently the chairs of committees control what issues will be brought before their committee, what bills will be considered, what witnesses will be called to testify, and what votes will be taken. This is the antithesis of democracy; the “lowest ranking” member of a committee represents as many people as the chairperson. Committee decisions should be made by consensus, and when that can’t be reached then there should be a vote in which the chair has no special privileges. Eliminate the practice of “senatorial holds” on nominations. Right now a single senator can block anywhere from one to all presidential nominations before the chamber. Recently we have seen Senator Richard Shelby of Alabama put a hold on 70 nominations from President Obama; his asking price to “release” the nominations was a slew of projects for his home state of Alabama. The practice of senatorial holds not only obstructs the working of the body; it presents our legislators individually and collectively as selfish buffoons and undermines efforts to have the public look at Congress in a serious manner. As an example, President Obama just reported, “My nominee for one important job, the head of General Services Administration, which helps run the government, was denied a vote for nine months. When she finally got a vote on her nomination, she was confirmed, 96 to nothing. … That’s not advise and consent. That’s delay and obstruct.” But this is a game that both parties play. Bring electronic voting into the Senate. Each roll call vote takes at least fifteen minutes; electronic voting can be almost instantaneous. Expediting the system is party-neutral. Ensure that any proposal that has the support of at least 20% of the members of either house can have an “up or down” vote. One reason why reforms in areas such as civil rights and health care is measured in centuries rather than decades or years is because many of the most creative and well-conceived ideas are not on our national radar because they never see the light of day when it comes to voting. Why is it that the Senate has never voted on a “Medicare for all” proposal, or even a public option mixed with private insurance? We know the answer to this question, but the bottom line is that each party has repeatedly stifled the ideas of the other party by not forcing on-the-record voting on the issues that are most important to the American people. It becomes trite to say that “everything I needed to know I learned in kindergarten,” but trite is often true. Perhaps the question should not be “what did you learn in kindergarten,” but “what did you forget since kindergarten?” When it comes to fair play and the best interests of the group, our politicians act as if they were absent when kindergarten happened. Maturity should not have a party affiliation. Things will change, and only change, when the party in the majority thinks about what its own best interests will be when it inevitably is again is in the minority. If politicians are blind to this reality, then we need more citizens to stand up and remind them.